This morning I decided to stop by the Technique Challenge on SCS just to see what it was. I usually don’t play along with that one but for some reason this really caught my eye. 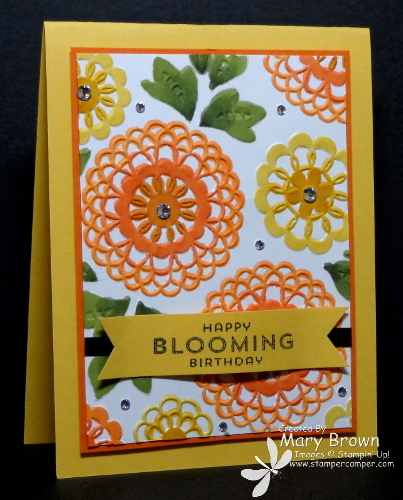 You were to use and embossing folder then color on it. Now this isn’t the same as adding color to the embossing folder then embossing. This is coloring AFTER you do the embossing. I decided to use my blendabilities. I think it looks cool but because the fibers in the cardstock breakdown some where the embossing is…the color from the blendabilities really does spread. But cool…fun look! 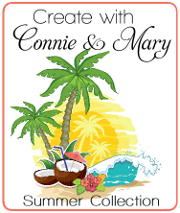 And speaking of fun…we have just started week 3 of Create with Connie and Mary Summer Edition 2104! This collection features products from the NEW CATALOG…you don’t want to miss it! If you are looking for some great ideas for the items in the NEW CATALOG, then this collection is for you! This entry was posted in Blendabilities, Challenge and tagged Flower Patch. Bookmark the permalink. Wow, Mary! That is gorgeous. Did you do much blending of the colors? Did it take forever?? I never leave comments on cards but I just had to because this card is BEAUTIFUL!!!! I have to CASE it for my August club but will not forget to mention it is YOUR creation. Thank you so so much for sharing. Was it hard to color it with all those small lines?